At 7:45am on the 7th of December 1941, the Pearl Harbor naval base of the US Navy's Pacific Fleet in Oahu, one of the eight major Hawaiian islands, was hit by the first bullets from the dozens of Japanese warplanes that were performing 'Operation AI', the surprise attack that led to the United States' entrance into World War II. Although the attack was an almost-immediate complete success, this did not strike the US military apparatus in the Pacific with the fatal blow that the Japanese command had foreseen. At the end of 1941, Nazi Germany, while in large control in Europe, had been carrying out its offensive against the Soviet Union for six months, arriving at the gates of Moscow. Japan was continuing its aggressive policy of expansion in Southeast Asia, threatening the main western colonies in the area (such as the place now known as Malaysia, then British, and the Dutch East Indies) after having already occupied the French Indochina. The attack on the main naval base of the US Navy's Pacific Fleet (which still has its headquarters in Pearl Harbor) was intended to make the United States unable to react to further Japanese attacks on colonies in Indochina and the Philippines, areas needed by Japan for the supply of raw materials. A military confrontation between Japan and the United States was widely expected by the majority of the public, but in December 1941 diplomatic channels were still officially open between the two countries and negotiations were under way. In addition to this, the United States did not expect an attack in Hawaii, which was relatively distant from the theater of war, and where the Pacific Fleet had been moved a few months from its previous base in San Diego, California. The design of the attack, which was headed by the commander-in-chief of the Japanese Combined Fleet, Admiral Isoroku Yamamoto, continued from the early months of 1941, but the definitive authorization of Emperor Hirohito only came on the 1st of December. The team of six aircraft carriers and several supporting warships had been at sea for five days, starting from a base in northern Japan. The number of Japanese planes that participated in the attack were over 350, divided into two waves. The first wave was aimed at the main targets, such as the largest warships, temporarily avoiding warehouses, submarine bases and command centers. The second wave was based upon attacking the other objectives omitted from the first. Other preferential targets were the planes parked in the bases in order to avoid an immediate aerial response. Together with the air attack, the Japanese also used five mini submarines that had sailed from the major submarines stationed a few kilometers away from the base, but this part of the attack proved to be an almost complete failure as four were destroyed or abandoned by the crew without causing any significant damage with the fifth losing track, never returning to the submarine base. The US soldiers were taken by surprise. The first wave, a fleet of 183 fighter and bomber aircrafts coming from the north, were detected by a small US Army radar station at a distance of approximately 155 miles (250 km) from the base. It was exchanged with a group of six bombers whose arrival was expected by the United States. Thirty artillery positions in defense of the base were almost completely unguarded, the alert level was low, and the hundreds of airplanes in the airbases not far from Pearl Harbor were parked very close to avoid sabotage. Of the eight major warships present at Pearl Harbor at the time of the attack, four were sunk in the shallow waters of the lagoon and all were damaged. The second wave of the Japanese air attack, divided into three groups with one being intended for a secondary objective, consisted of 171 aircraft that arrived at the base almost simultaneously from different directions. Of the 402 American aircraft present in the Hawaiian islands, only eight US pilots were able to get up in flight. 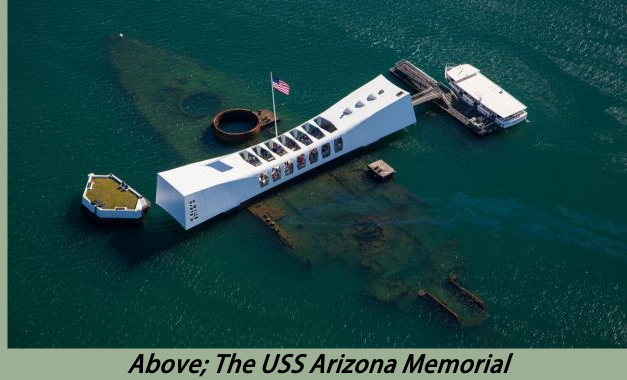 Overall, the attack lasted only an hour and a half, though it had devastating effects: 68 civilians and 2,335 American military personnel, nearly 1,200 of whom in the explosion of the weapons warehouse in the battleship USS Arizona, were killed in the chaos. 1,143 more people were wounded and the US lost a total of 188 aircraft. The Japanese also lost a total of 64 men. A few hours after the attack on Pearl Harbor base, Japan attacked the Philippines which were under US control. On December 8th 1941, US President Franklin D. Roosevelt delivered a famous speech in front of the assembled chambers of the American Parliament saying that the 7th of December 1941 would be "a date that will live in infamy." Less than an hour later, the US Congress passed the President's request for a declaration of war on Japan. During the war, the attack on Pearl Harbor was used very often as propaganda to encourage public support for American involvement. On the 11th of December 1941, Germany and Italy declared war on the United States following the signing of the Tripartite Pact in September 1940 in Berlin by representatives of Germany, Italy, and Japan. Although the attack on Pearl Harbor was an immediate success, its consequences were not so long-lastingly favorable to Japan for two main reasons. The first was that the surprise attack swept away the doubts of American public opinion of the need to go to war against Japan and the fascist and Nazi regimes in Europe, as in the months before the attack, the front of the supporters of isolationism of the United States had always been consistent and largely prominent. Secondly, from a militaristic point of view, the three US aircraft carriers of the Pacific Fleet (Lexington, Saratoga, and Enterprise) were not present in the base at the time of the attack, a fact that the Japanese were aware of, resulting in the decisive factor in the Pacific during the war being the air superiority rather than the naval battles.